Brick technology Launch BS Fixings - Now Live! BS Stainless have been a client of Brick technology for many years and we have happily watched the company’s range of products and services increase along with their global reputation for excellence. 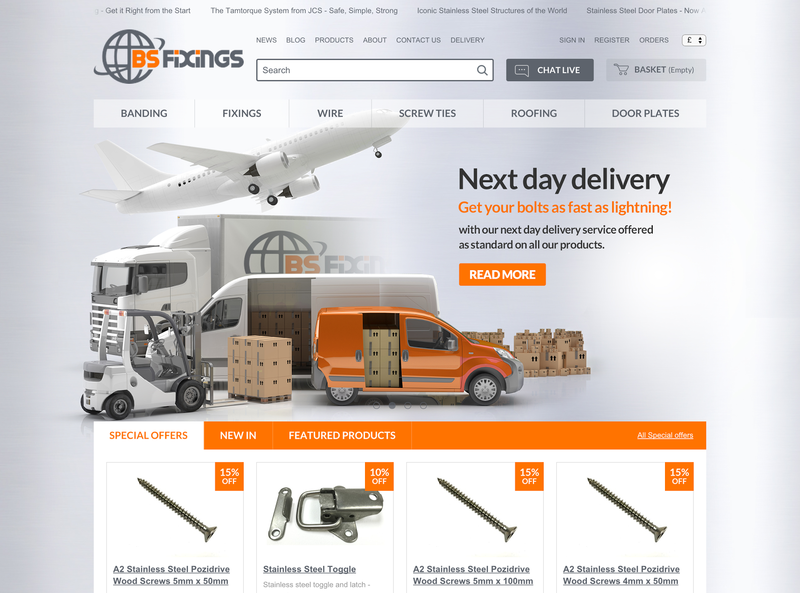 In 2013, BS Stainless launched their interactive online shop which was an immediate success and we are pleased to announce that the shop is now relaunched and rebranded as a new ecommerce website - BS Fixings. Operating from Bamber Bridge in Preston, BS Stainless supply stainless steel products to a global market, from massive industries such as LNG processing to supplying nails & screws to independent local businesses, the company have a truly impressive reputation in the sector. The BS Stainless online shop was created to allow customers access to sub-industrial quantities of stainless steel fastening solutions and proved instantly popular. Always quick to take opportunities to develop and evolve the company, BS Stainless decided that launching the rebranded BS Fixings would enable them to offer their customers a more modern, accessible service. Brick technology have used our close knowledge of the company to create an adaptive website that accurately reflects the dedication to quality that has been the cornerstone of company development at BS Stainless. We recently reported news that search engine giant Google will be using ‘mobile friendliness’ as a ranking signal as of April 21st 2015. Completely mobile-friendly - indeed, friendly to any device it is accessed from - BS Fixings is, like all Brick technology ecommerce websites, ready for Google’s imple­men­ta­tion and the effect it will have on SEO. The new BS Fixings website uses cutting edge mobile web design to ensure a perfect browsing experience every time, giving the professional look and feel required by a company of such distinction. We look forward to continuing our work with BS Fixings as they increase their product range. As each new product becomes available, staff at the company use the unique, bespoke Content Management System that has been custom-built and developed by Brick technology to quickly add the new content. Starting your journey with Brick technology is easy - simply contact us and let us do the rest. We will guide you through a consultation and review of your current website, if any, before creating a bespoke plan of how we can revolutionise your business. Contact Brick technology Web Development Lancashire now to speak to our team. The future is waiting.